Yes, global warming is real. Yes, sea levels are rising. This is especially the case along the East Coast, according to the study. Below is a version of the map contained in the study. 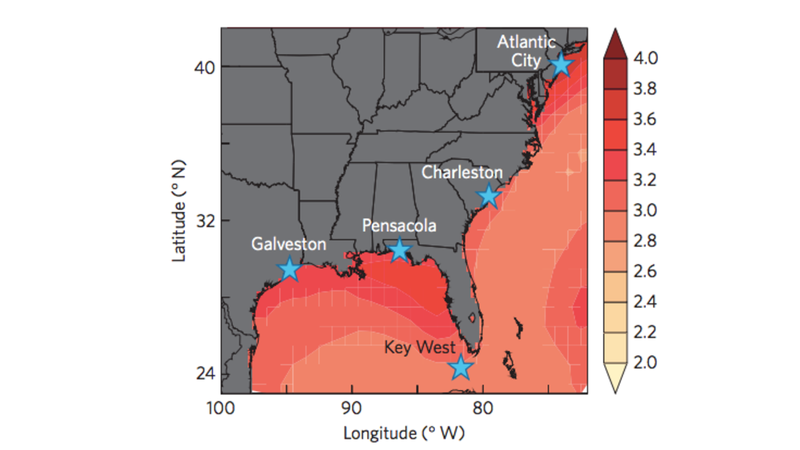 The redder areas show higher projected temperature changes—and warmer water means higher seas. According to the study, the East Coast has already experienced above-average sea level rise over the last century. While the global average is about eight inches over that time, much of the East Coast has seen a foot or more of rise. What the new study shows is that even if we were to somehow halt increases in global temperatures, the risk of large flooding events on the East Coast has now multiplied. That's because the intensity of North Atlantic storms is likely to increase due to the correlation between warmer waters and higher potential energy. While these projections are less certain than sea level rise, "scientists are taking them with increasing seriousness," Columbia says. The main question of the study focused on the probability that sea level rise and storm intensity could act together to eventually "produce more than the sum of their parts," as the Columbia team puts it. Even if we were to halt climate change now, the study's authors suggest the risk of substantial flooding on the East Coast has increased 75 times, depending on the location. And if we stopped fighting climate change altogether, the scientists say the flood index might go up 35- to 350-times. "Our results indicate that the U.S. East Coast flood hazard will increase substantially over the 21st century, even with limited future warming and if only central estimates (median projections) are considered," the authors write in the paper. "These results echo other analyses showing large increases in 21st century flooding due to SLR [sea-level rise], while introducing a probabilistic approach to incorporating changes in storm surge and covariance in these two drivers of flood risk."